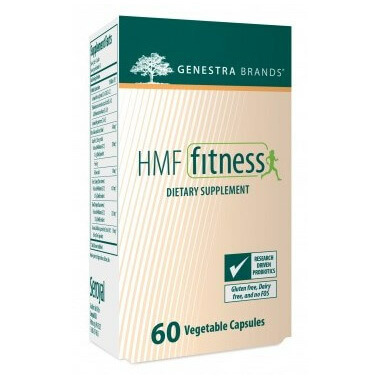 Genestra HMF Fitness is a combination of research-driven probiotics and a clinically studied citrus and guarana extract blend that helps to support healthy weight management. In two randomized, double-blind, placebo-controlled trials, supplementation with the extract for 12 weeks, in combination with a strict diet and exercise regimen, significantly supported healthy weight management, body fat composition and abdominal circumference (hip and waist) when compared to the placebo group. Research demonstrates that citrus fruits found in the extract, including grapefruit and oranges, contain bioflavonoids that support lipolysis (breakdown of triglyceride into glycerol and free fatty acids). As daily probiotic supplementation is also considered a necessary component of any healthy diet, HMF Fitness contains five strains of proprietary probiotics to contribute to a favorable gut flora and support gastrointestinal health. 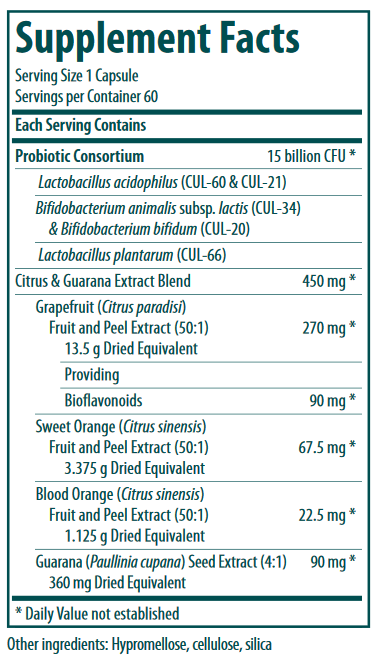 Included in this probiotic blend is L. plantarum (CUL-66), which has been studied in vitro for its ability to modulate intestinal cholesterol metabolism. Recommended Dose: Take one capsule two times daily with meals or as recommended by your healthcare practitioner. Please be advised that Well.ca follows manufacturer guidelines for storing & shipping probiotics. These Genestra HMF probiotics are shelf stable and will be stored in a cool, dry place as per the manufacturer guidelines.